Building a stone fire pit is easy and will provide hours of enjoyment. Are you great with your hands? Does getting them dirty make you happy rather than sad? And are you one of those people who loves sitting in your backyard on a warm summer night, staring deeply into the burning flames of a fire? If you answered yes to these questions, then maybe you already have a stone fire pit in your yard. If not, then you should probably build one, don't you think? Its not hard to learn how to build a firepit! If you're willing to do the work yourself you can actually build an elegant stone fire pit for just a bit more than you'd pay for a pre-packaged, metal fire pit. So why waste your time with something like that, when you can have a permanent, stone installation in your back yard? All you need are a few supplies, tools and tool parts. Keep reading to find out how you can build your own pit for only a few hundred dollars. 1. Purchase Stone: Before you start, figure out the size, shape, and place where you'd like your stone fire pit to go. You'll want a mixture of stones and bricks. You'll place the bricks on the interior of the fire pit, and the stones on the outside. Then take the measurements (for example: circle, four feet across, two feet high) to a stone yard and select the stone you want for the project. Many stone yards will happily deliver the stone to your home if you don't have a truck. 2. Prepare the Area: First you want to get a perfect circle where your stone fire pit will go. Hammer a piece of rebar or other sturdy metal into about the center of your fire pit's circle. Then take a piece of string half the length of your fire pit's diameter (if you want a 5 foot pit, use 2.5 feet of string) and tie one end around the rebar. Loop the other end around a can of spray paint or landscape paint, then mark the circumference of the circle by pulling the line tight and spraying in a circle. If you want a square pit, just mark each side with pieces of 2x4 or other strait wood and use a t-square to ensure you have right angles at each corner. Then along the pieces of wood. 3. Excavate the Pit: Then just dig out the area inside the paint until it is about 6 inches deep. 4. Mark the Walls: You currently have the full diameter of your entire fire pit. Now you need to mark off the footing, or where the walls will go. Cut another piece of string, but subtract the width of the fire pit's wall. Attach the string and spray another circle. This will be the actual pit where you'll build your fire. 5. Pour the Footing: Follow the instructions on a pre-packaged bag of cement and pour the cement into the area between the inside and outside circles. Continue adding the cement, and leveling it, until it's about 2 inches below the surrounding grass. Add pieces of rebar about 2 feet long to the cement and tap them in until they become completely covered. Then allow the cement to dry. 6. Lay the First Stones: Start by placing a ring of stones around the outside of the fire pit. Once they're in place, you can begin with the bricks. Trowel some mortar on the inside of the stones and press the first brick into place inside the stone. Apply mortar to one of the ends of the brick, then lay another brick in place and mortar one end. Continue doing this, while removing excess mortar and checking that each brick is level, until you have the first ring of bricks in place. 7. 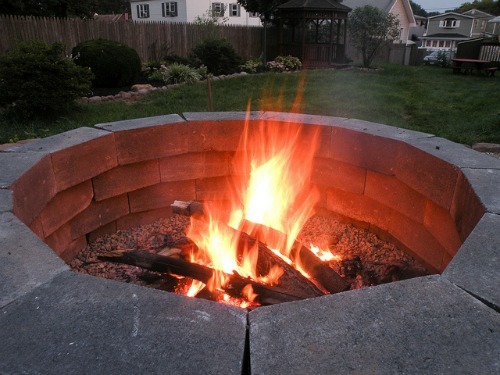 Finish the Fire Pit Wall: Continue adding bricks and stones to your pit until you reach the desired height. Remember to apply mortar to the tops of the stones and bricks, as well as to the ends of the bricks. Keep stacking, and stagger the joints between the bricks to avoid creating weak spots in the wall. Fill any gaps between the stones and bricks with mortar as you work. 8. Apply your Cap Stones: Use a lot of mortar for this step. Apply it to the tops of the layered stones and bricks, covering both the stones and the bricks. Pick out stones that will fit neatly together, then set them into the mortar. Work around the top of the fire pit, and continue checking that the stones are level. Fill any spaces between your stones with mortar. When the mortar has nearly finished drying, you can use a stiff brush to scrub any stray mortar off of the stones. 9. Paint the Pit: Once the mortar is completely dry, spray down the pit with water to remove any dust and other debris that's remaining. Then use black stove paint to spray the interior of the fire pit. 10. Build a Seating Area: This is an optional step, but it will really give a nice, finished look to your pit. Rather than leaving your guests to sit on the grass, you can create another ring using a piece of rebar in the center of the pit. Tie a much longer piece of string to it (if you have a 5 foot diameter pit, you may want to go with a 10 foot piece of string to provide five extra feet for seating, for example) and mark off the area as you did before. Now you can excavate that area to about 3 inches. Fill the space with some landscaping fabric, then you can top it off with crushed stone, sand, or whatever material you desire. Add some lawn or deck chairs, and once the paint has dried (which it may have done while you created your seating area) build a fire and enjoy the view! As you can see, building a stone fire pit in your back yard is a pretty simple task. It should only take you an afternoon or two, and once it's there, all your friends will ask about your next barbecue. This pit will give your backyard a beautiful addition and will make yours the envy of the whole neighborhood. Still need to do work on your yard, but have a broken mower, tiller, or trimmer? Don't fret - and definitely don't go out and buy an expensive replacement. You can find all the spare parts you need for your lawn and garden equipment with eReplacementParts.com. You can find tutorials and guides that will help make repairing your machines a breeze, too. At eReplacementParts.com, we believe doing things yourself makes the most sense, whether you're building a backyard fire pit or fixing your own tools, appliances, and equipment!